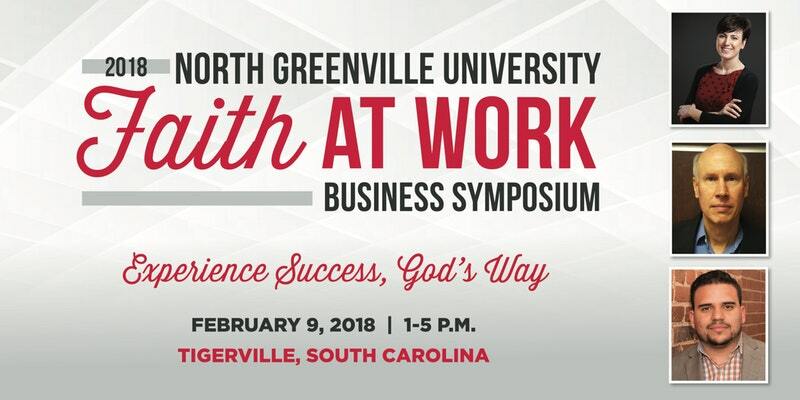 North Greenville University is pleased to host its third annual Faith at Work Business Symposium to be held on the NGU campus from 1:00 p.m. to 5:00 p.m. on Friday, Feb. 9, 2018. Open to all students, faculty, and community, the Symposium is comprised of a series of lectures by three Christian business professionals. Speakers for the 2018 Symposium include Brandy Hart Amidon (’02), First Female Mayor of Travelers Rest, SC, David Barge, CEO, Barge Timberland Management, Inc., and Ramon Nieve-Lugu, Principal, Unicomm Media Group. Faith at Work gives the speakers an excellent opportunity to share their experiences as Christian business professionals who integrate Christ-centered values in business with students and local business leaders. The event is free and registration is available on Eventbrite. For more information contact Symposium organizer Jason Ross at 864.977.7026.